It’s safe to say that Orlando is a holiday destination like no other. Famous for its huge selection of theme parks, this city in Florida is home to three major resorts: Disney World, Universal and SeaWorld, as well as various other attractions, like Legoland, the Kennedy Space Center and Gatorland. For those planning a getaway in here, there’s a lot to think about – you’ll have to find cheap flight booking to Orlando, as well as suitable accommodation, of course. Then there’s a question of which theme parks to visit – after all, with so much to see and do, it’s impossible to get it all done in one trip! This two-minute and 15-second ride at Universal Studios might start out calmly – as if you’re on a quiet tour of Dr Bruce Banner’s laboratory. However, things quickly liven up as you approach the gamma-ray accelerator: something has gone wrong with the experiment and as lights flash and sirens blare, you’ll accelerate from zero to 40 miles per hour in two seconds flat. 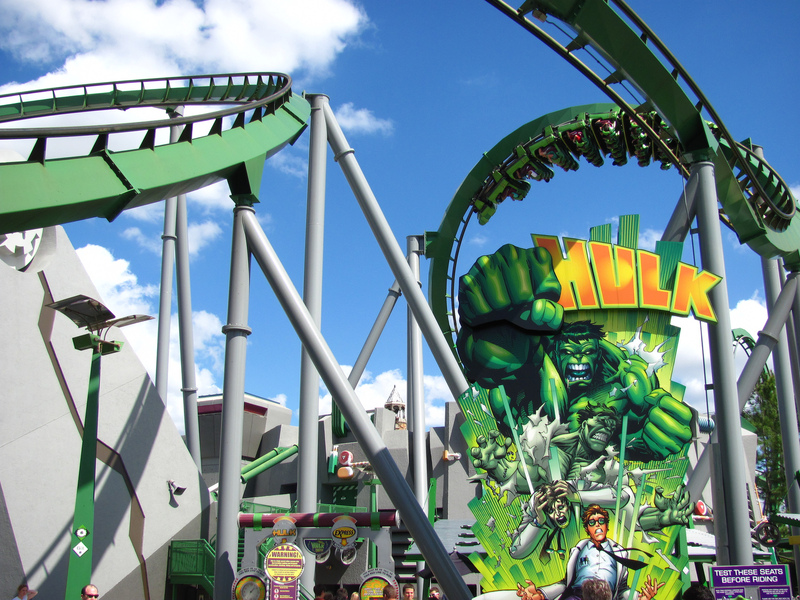 Feel the thrill of the Hulk smashing his way along the green tracks, launching up to 150 feet in the air, diving through two underground trenches and spinning through seven immersions, including a zero-g roll. Based on a scene from Harry Potter and the Goblet of Fire, this exciting roller coaster at Universal Studios puts you right in the action of the Triwizard Cup, as you take to the skies on one of two “dragons” – the Chinese Fireball or the Hungarian Horntail. The two tracks intertwine and the rides incorporate several inversions, a zero-g roll, corkscrews, vertical loops and a cobra roll, but offer completely different experiences. You’ll have to try both and decide for yourself which one is the best. Pick your favourite song before you strap in, and you’ll be able to listen to it as the coaster climbs 17 stories to provide spectacular views of the Universal Studios theme park below. Then, hang on tight as the ride plunges downwards at 65 mph, twisting and turning through six near-miss moments and a record-breaking loop. Best of all, you’re reactions are recorded on video for the duration of this multi-sensory experience and at the end of the ride, you can opt to edit the whole thing into a music video that you can take home and share with friends. This roller coaster at Epcot is an interactive experience that offers hair-raising excitement mixed with a bit of engineering ingenuity. Start by customising your own concept car in the Chevrolet design studio. Once you’re happy with your vehicle, you’ll be able to “test drive” the machine at speeds of up to 65 miles per hour, going around hairpin turns, descending steep hills and along high-speed straightaways. Then, at the end of the ride, you can find out how well your car performed and even produce a television advert featuring your custom car. Located at Disney’s Hollywood Studios, this high-speed roller coaster is amplified with a unique soundtrack recorded by rock group Aerosmith. Feel the force of a supersonic F-14 as the ride takes you from a zero to sixty in 2.8 seconds. You’ll also experience three inversions, giving you upside views of a miniature model of Los Angeles below you. Best of all, this roller coaster doesn’t feature standard cars. Instead, you’ll be sitting in the lap of luxury: a super-stretch limousine furnished with a state-of-the-art sound system.